Environmental aggressors and external factors have been shown to contribute more to aging than genetics, with UV rays causing roughly 80% of wrinkles. The body's naturally produced antioxidants start to decline in our 20s as the balance shifts to repair to fight free radicals. Prevent damage and protect cell longevity, while evening skin tone and maintaining moisture with the Alchemy Technoblend. 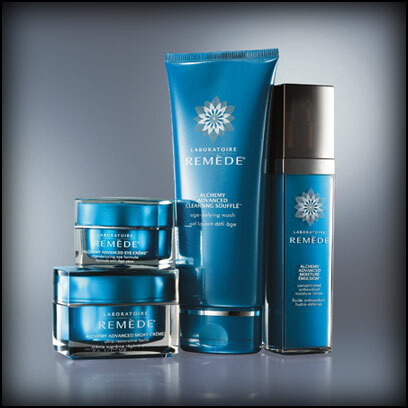 A Laboratoire Remède classic and perennial best seller, they address the early signs of aging and beyond, protecting with powerful antioxidants, and maintaining essential hydration necessary for proper skin function. A targeted, solution-specific formula continuously working throughout the day to prevent the early signs of aging, while maintaining moisture and balance, and evening skin tone. This dynamic ingredient "cocktail" is designed to hydrate skin, while brightening and stimulating cell renewal. Antioxidants are crucial as cells work to repair skin from free radicals and inflammation, with internal antioxidant production slowing as we age. Green Tea Extract - Stimulates cell renewal and scavenges free radicals, providing super antioxidant benefits and protecting DNA damage. Grapeseed Extract - Smoothes and moisturizes skin while fighting free-radicals, maintaining cell strength and protecting cell life. Sodium Hyaluronate - Restores and improves cell cohesion while reducing inflammation, smoothing and relaxing tightness .